I’m going to confess that when I decided to be an architect who specializes in residential projects, I didn’t think I would end up traveling around the country doing them. How I got here isn’t all that interesting – it seems like once you become that sort of architect, more people are willing to go outside their own backyard to find someone they want to work with on their project. What has been interesting is the process I’ve gone through when deciding when I need to travel so that I can maintain my standard level of care similar to projects I work on locally. This has been particularly true during the construction phase. How a house get’s built is incredibly important to me and I won’t take on projects that do not include my involvement during the construction period. It’s simply too important and there are thousands of things that can get missed during this phase that can create a chain reaction of events with undesirable consequences. Since I don’t like taking trips to faraway job sites just for the sake of taking a trip, I have identified certain key moments during construction that I absolutely need to be on site. I think I will make that specific list its own topic but for today, I will focus on just one of the really important job site visits [drumroll please] the Electrical Walk-through! This is one of my projects in California – approximately 3 hours and 40 minutes by plane away from Dallas. 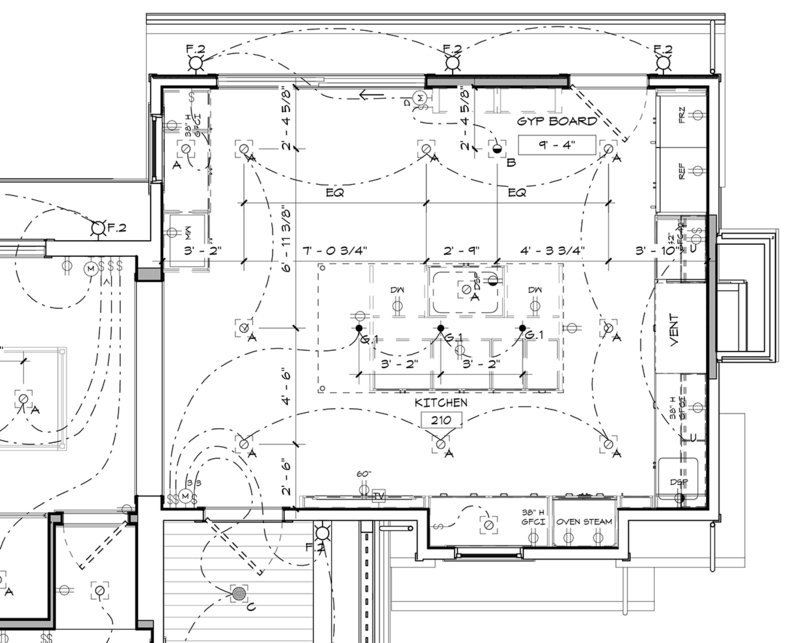 What you are looking at above is a partial electrical and lighting plan for the kitchen. As you can see, there is a lot going on in this space. This is an existing house that was completely taken down to the studs. We reconfigured about 25% of the space, but the entire house received new interior finishes, new windows, doors, plumbing, HVAC, roof, etc. and on and on. What was once the kitchen is now a large wet bar, the old large family room is now the kitchen … there isn’t a room in this house that doesn’t have our fingerprints all over it. Last week, I was out in Sunny California for two days walking the house, both with the electrician and then again with the owner, to review all the locations of lighting, electrical boxes, and wall switches. One of the other things I do when I go on job sites is that I take a million pictures. Technically for this trip, it was closer to 300 but the point it, I document EVERYTHING. I now have a record photo of every wall, floor and ceiling of this house and where everything is located. The picture above is in the kitchen and in this space alone, there are recessed lights, pendants, speakers, sprinkler heads, freon lines, and ductwork. Are the in the right place? I’ve got to figure this sort of stuff out prior to insulation going in and sheet rock going up. Plus, I want to know where everything is buried. Knowing where all the plumbing runs are located is exactly the sort of thing that I am on site documenting when I make these sorts of field trips. Hopefully, we’ll never need it, but I don’t like to hang my hat on “hopefully.” The other key component to a trip like this is a walk-through of al the electrical outlet locations and light switches with the owner. It’s pretty easy to change or modify something now, so this is the time to do it. Here’s a look at another section of the electrical and lighting plan for this house. We did the mechanical system (re: air conditioning) as design-build for this project. We had several meetings with the HVAC contractor, and once we marked out the loads and duct pathways, we coordinated alignments on site. If this were a commercial project we would have retained the services of an MEP (Mechanical, Electrical, and Plumbing) engineer – but as a residential project, it is common that we will do our own lighting and electrical design, and then coordinate HVAC with the sub-contractor. Duct work. Exhaust Fans, Sprinkler pipes. HVAC registers. Outlets. Light switches. Plumbing lines … most of this stuff will disappear in a few weeks and it seems that this is the sort of stuff that gets skimmed over unless you have someone with the specific task of double and triple checking locations. If I had to put a number on it, I would guess that there were about 1,200 items to be coordinated from this scope of work. The good news is that the various subcontractors did a good job and there were only a handful of items that needed adjustment. The owner and I had gone through the layouts a few times on paper prior to this point of construction so there were only a few things they wanted to modify after walking through the project. For the record, I really like being a part of this walkthrough with the clients. This is one of those “in real time” lifestyle moments where they pretend what it would be like to use their house. Trying to re-imagine the entry light switch sequences to determine if our paper walkthroughs were close to the real thing. Pictures like this one are purely for record keeping purposes. We know where studs are located, and how the plumbing fits within the walls. This is a look at the “wet wall” (construction jargon for the wall where all the water lines are located) in one of the bathrooms. When you’ve spent a fair amount of time on a job site, you can glance at a picture like this and tell instantly what’s going on – not to mention the quality and capabilities of the subcontractors doing the work. Granted, there is some wood framing chaos going on but as I mentioned in the beginning, this was an existing house and the framing was ridiculous in places. There wasn’t anything magical or difficult about this particular site visit – yet it was an incredibly important trip to make. The secret to well-built projects is really about proper communication and coordination. The sooner you can identify something that needs attention, the more options you have for possible remedies. Not to mention, the remedies will be less expensive to address now even if the owner isn’t paying for them – something that contractors and subcontractors can readily appreciate.